The body can experience pain in many different ways. Likewise, there are several different approaches that a Dallas chiropractor can take to help relieve acute and chronic lower back pain. Technological advancements have provided doctors specializing in chiropractic care with the ability to help patients more efficiently by targeting specific areas of the body with ultrasound therapy. Holistic medicine doesn’t just relieve immediate pain and discomfort but has the ability to address the body as a whole. One of the most recent ways that Premier Health Chiropractic and Wellness is helping our patients is through Ultrasound Therapy. Ultrasound Therapy has been around for 80 plus years and is a successful non-invasive procedure that helps to treat multiple ailments. Therapeutic ultrasound uses high-frequency sound waves that non-invasively penetrate tissue, creating a warm, relaxing sensation below the surface of the skin. Because the sound waves are vibrating at such a fast rate (up to one million cycles per second) they help to break down and disperse unhealthy hard tissue buildup. The rise in temperature also stimulates increased blood flow, relaxes muscle spasms, and can gently massage damaged tissues in order to speed up the body’s natural healing process. 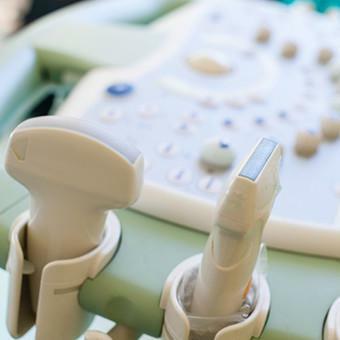 Since this is a non-invasive procedure, Ultrasound Therapy comes with a very low risk. However, chiropractors suggest that it is not suitable for resolving bodily issues near the womb of a pregnant woman. Even though the name sounds like it would be friendly, this treatment could put the pregnancy at risk when used on this specific part of the body. If you are currently pregnant, we have other chiropractic services for pregnant women. At Premier Health Chiropractic and Wellness Center, we believe that achieving your health potential is an ongoing process and not a one-time fix. That’s why thousands of patients have chosen us as their destination for chiropractic care. Over the years, so many patients have returned, seeking continued treatment from our staff because of the great experience they have had. Each of our patients is determined to improve their overall quality of life, and we’re here to make it possible. Contact us today to find out more about our specific treatments and how you can schedule a free consultation.